This book was published following a seminar on the life and times of Brendan Corish that was held in the historic Beggars Bush Barracks, Dublin in March 2006. Taking place to mark the presentation of the former Labour leader’s papers to the Irish Labour History Museum, the event featured speakers who were prominent in Irish public life during Brendan Corish’s political carer in the 1960s and 1970s and knew him personally. The warmth and high regard in which Corish was held by his peers is evident as their respective contributions to the proceedings, presented in this book, deliver a striking portrait of the much-admired Labour leader. 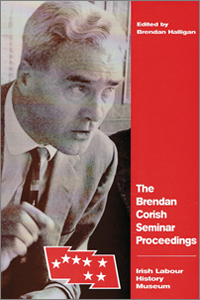 The Brendan Corish Seminar Proceedings is a limited edition title available only from this website. To inquire about receiving a copy, kindly write to us here, referencing “Brendan Corish Seminar Book”.